As temperatures rise, your compressor’s performance suffers, resulting in lost time and decreased production, ultimately affecting your bottom line. We’ve developed an inlet cooling process that increases horsepower density and improves production by up to 25 percent, no matter the temperature. One challenge with modern gas turbines is that they lose significant output and efficiency as air temperatures rise, forcing users to accept lower capacity or add incremental equipment to compensate for this loss. 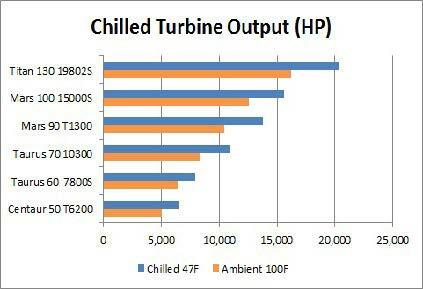 The chart to the right shows the performance of several leading gas turbines used to drive compressors. For one innovative integrated oil and gas firm, Petróleos Mexicanos S.A. de C.V. (PEMEX), the opportunity to gain significant incremental gas flow from its’ existing facilities was very compelling. PEMEX worked with Everest Sciences of Tulsa, Oklahoma to evaluate the potential benefits of providing inlet chilling to the existing Solar Taurus 60 gas turbines at its Parédon facility. This valuation showed a significant value proposition and PEMEX issued an international request for proposals in 2014. Everest Sciences and its local partner Equipos Industriales del Golfo (EIGSA) was awarded the contract to supply three ECOChill hybrid indirect evaporative chilling systems to PEMEX in November of 2014, and released to commence work in early 2015. The ECOChill solution is highly efficient due to its novel use of indirect evaporative cooling operating in series with mechanical chilling. For most applications, this solution provides the efficiency of evaporative cooling without using incremental water, while still providing the consistent and guaranteed inlet air temperature of mechanical chilling. Inlet cooling optimizes gas turbine performance by cooling the gas turbine inlet air and providing more mass flow for combustion and increasing the efficiency of the gas turbine compressor. Increased output from existing equipment optimizes the overall facility, leveraging the existing staff and reduces the overall operating cost on a $/HP-hour basis. 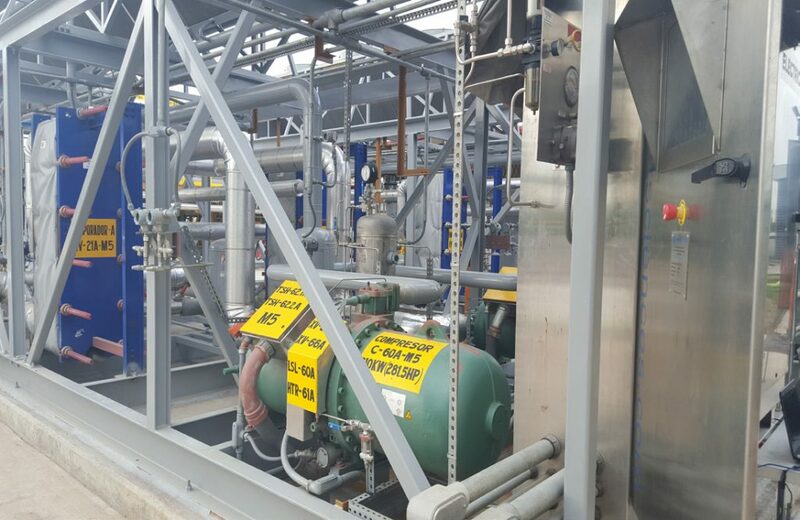 For the PEMEX Paredon project, the modular equipment was factory-packaged and tested and then delivered to the site for installation by Everest Sciences EIGSA. The two ECOChill systems were installed in late 2015 and commissioned in early 2016. The ability to gain 15-25% incremental horsepower continuously over a twelve (12) month period is a key advantage of the company’s modular inlet chilling solutions. Future projects with PEMEX are expected to complete quickly now that all parties are familiar with the technology. A key benefit of ECOChill is the automated and reliable operations of the chilling solution, providing a consistent inlet temperature and thus system gas flow even as the ambient temperature varies, as shown in the Figure 2 at the top of the page. The key metric for all gas transportation companies is gas flow. As shown in Figure 2, inlet chilling will keep the gas turbine inlet temperature at a much lower and consistent temperature. 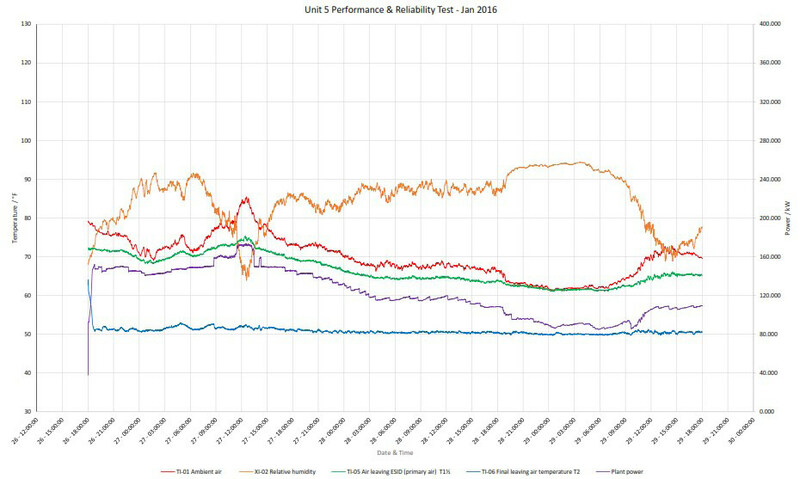 For the PEMEX Parédon plant, this reduction in inlet temperature has increased the per unit gas flow from 30.0 MSCFD to 33.4 MSCFD in coldest month of the year, in the summer it is expected that the per unit gas flow will increase by an additional ten percent (10%). Everest Sciences specializes in modular turbine inlet cooling systems for gas turbines 25,000 HP and smaller. Our patented process uses a highly efficient hybrid indirect evaporative and chilling technology to cool process air. This cycle can operate with minimal or no usage of water. Our modular systems are designed to operate reliably in hazardous areas; install quickly and integrate with our customer’s control systems.